I quote these two short snippets because when the Hong Kong based magazine “Asia Weekly” gave an account of the “Reting Incidents” that can be regarded as a turning-point in recent history, it simply replicated the story about Reting Rinpoche and Shideling that had been manufactured by CCP intellectuals. I have never met the 5th Reting Rinpoche but I have been to Shideling, the place that used to be a Buddhist monastery and was turned into ruins, innumerable times. Therefore I can only sneer at the claim that the other simultaneously reigning Rinpoche, Taktra, sent people to destroy Shideling. So who did really destroy Shideling? Many years ago, when I was still working for the Tibet Autonomous Region Federation of Literary and Art Circles, I interviewed several elderly people, all of whom witnessed and experienced the great changes and great loss that gradually happened after the 1950s. Their version of the story is totally different from the accounts given by “Asia Weekly”. The retired cadre Wangchuk La, who was sent to Tsemonling Monastery by his mother to become a monk, told me the following: Shideling Monastery was heavily damaged in March 1959. In the name of “putting down a rebellion”, the army of the CCP turned the city of Lhasa into a place of massacre. Monks that were captured at different monasteries were partially locked up at Shideling, including himself. He had witnessed himself how the floor of the Buddhist temple was full of injured bodies, Buddhist statues were also ruined, bent and incomplete. But what really destroyed Shideling was the Cultural Revolution. Back then, there were the “Red Guards from the far-away capital” that started the revolution, the so-called “serf emancipation” vagrants, the Henan Opera Troupes, the local red guards, the pro-Tibetan rebel faction and the working class brothers. They installed a massive tweeter on the highest point of Shideling, turning it into the “main rebel” broadcasting station. I interviewed one of the people who was a student Red Guard back at that time and who is a well-known ethnologist today. He said that the broadcasting station was an immensely important propaganda point for the rebel faction. Thereupon Shideling became a battlefield where the different factions attacked and fought with each other. One hand grenade was countered with innumerous machine gun bullets. Once the smoke and fire had vanished, the once 5-storey-high Buddhist Palace was reduced to three storeys. The monks had been running away, were arrested or murdered just in time for the empty rooms to be taken over by the People’s Liberation Army (PLA), subsequently occupying it for many years. 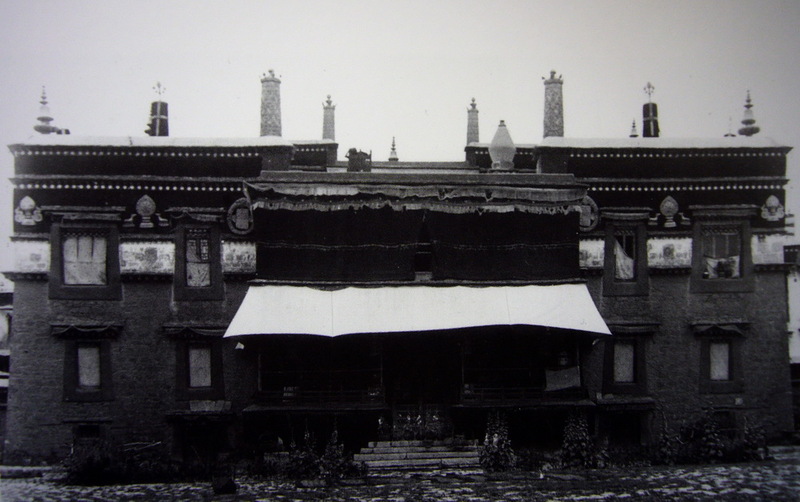 Shideling became a barrack, in the same way that Jokhang Temple became the PLA’s pigsty. In reality, Shideling’s downfall was completed within half a century, but a thought-provoking fact is that this downfall is now contested or even being kept secret. Some CCP intellectuals that specially revise history do not want to mention the many proofs left behind by this “human calamity”; they simply say that already before Tibet had been peacefully liberated, the once reigning “Reting Living Buddha” had become a “patriot”, and after he was persecuted to death by the “Taktra Living Buddha” under the guidance of the British Imperialists, Shide Dratsang was burnt down. This is really utter nonsense. Turning a monastery into a battlefield, a military barrack, a stronghold is more shocking than turning it into a hotel or a storehouse. One can really say that in the history of Tibet, none of the previous religious disputes have ever produced such massive ruins. These ruins are all pieces of evidence of the massive changes that occurred in recent history. Until the present day, on the inner wall of the three-storey high Shideling, we can still clearly recognise the Chairman Mao quote: “Be United, Alert, Earnest and Lively” as well as many other messy but historically tainted scribblings. Reprinted by permission. Originally published at http://highpeakspureearth.com/2013/how-was-shideling-destroyed-by-woeser/.